I know there’s something nostalgic about cracking open a can of cranberry sauce and sliding it onto a platter. Seeing it sit there, in its still-cylindrical form – rings and all – can certainly bring back childhood memories. But this is October Unprocessed. We want something not only healthy (with no funky ingredients we can’t pronounce, thank you very much) but we want something tasty too. 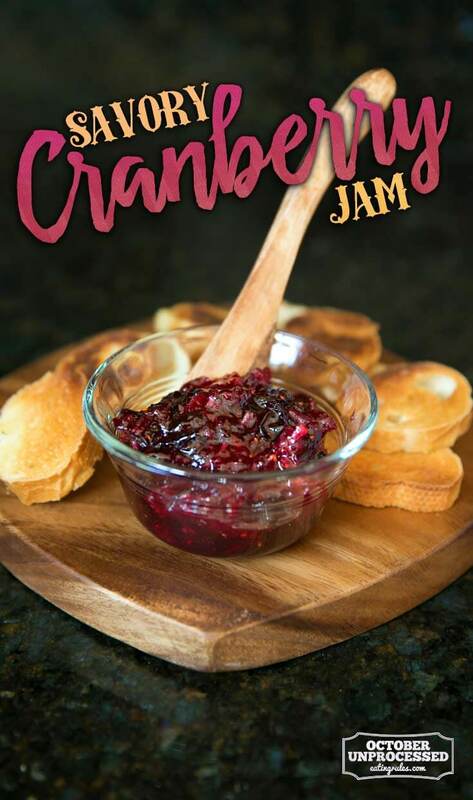 This Savory Cranberry Jam will have all your guests taking out their phones to document just how good it is! There are just six simple ingredients in this side dish and it only takes about 15 minutes or so to make. 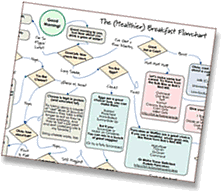 It really couldn’t be easier and seeing it all come together is really exciting – if you get excited by these kinds of things! (I know you do, that’s whey we are all here!) You might be tempted to leave out the raisins and although you could, the raisins add a nice sweet note to the otherwise savory ingredients. Looking for another fall appetizer? 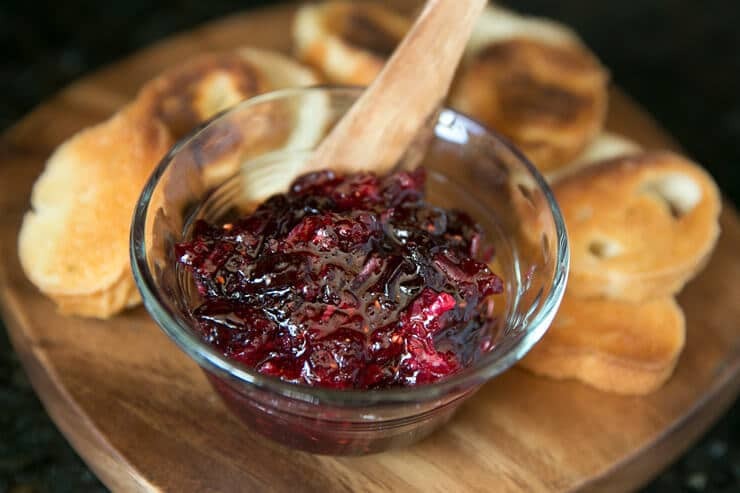 Try this yummy Apricot and Fig Tapenade, full of nothing but real, healthy ingredients. Savory Cranberry Jam is so easy to make - and it makes a beautiful side dish or appetizer that tastes better than any pre-packaged version. To serve as a crostini appetizer, slice a baguette in 1/3 inch pieces and toast until golden brown on both sides. 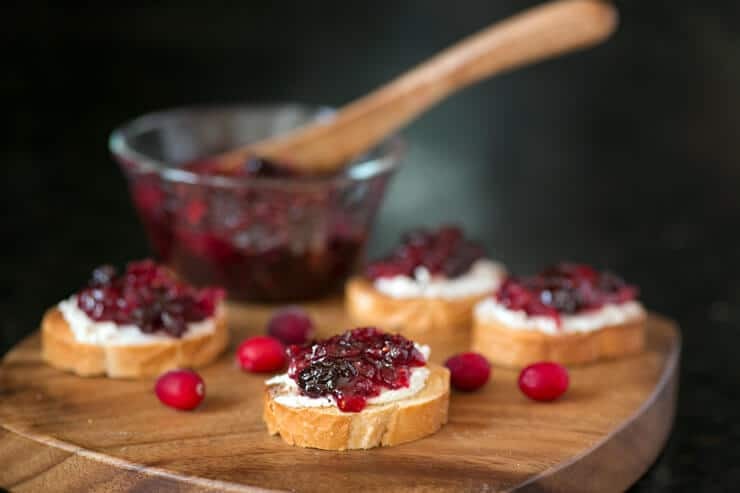 Spread the toasted baguette with goat cheese (or your other favorite cheese), then top with the jam. In a medium saucepan, add the first six ingredients. Continue cooking, stirring and mashing often, until the jam has thickened, about 10 minutes. How big is a serving size? My father-in-law is 3 weeks post radiation & infusion treatments and has not regained his sense of taste. We’re struggling to find calorie dense foods since he is struggling to eat anything. This sounds so good! I’m definitely trying this. Thanks so much for sharing.